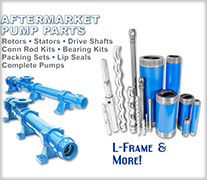 Aftermarket Pump Parts in Calgary | APEX Equipment Ltd.
All Prime pump’s rotating elements and other components are interchangeable with Gorman Rupp type T & U pumps. Liberty Process Equipment, Inc. offers in-stock aftermarket parts to fit Seepex® brand Series BN and MD series Progressing Cavity Pumps with our Victory Line. We have many of the most popular available sizes of rotors, stators, coupling rods, joint kits, seals, and other spares for all your specific pumping applications. When your ‘off-the-shelf’ single overhung centrifugal pumps are failing too often as a result of bearing and mechanical seal failure, APEX Equipment can specify and supply a bearing housing upgrade for your existing pumps that will maximize your MTBF, guaranteed. Please fill out the form below for your requests and we will get back to you as soon as we can.